We have again maintained our position as the region’s most active corporate legal dealmaker for the fourth year running. The data published by Experian MarketIQ, which tracks M&A deals valued at over £500,000 at regional and national level, has found Muckle to be the region’s busiest legal adviser in 2017. 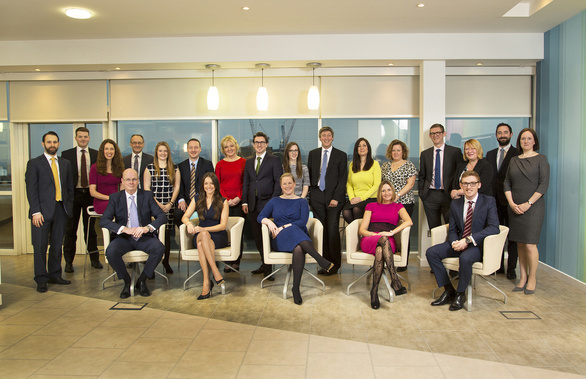 Our corporate team advised on 35 deals, nearly double its nearest competitors, who each advised on 18 deals. Check out the full 2017 Experian report for more details (see page 38 for the North East section). The latest results mean that we have been top of Experian’s dealmaker league since the end of 2014, leading the way again in 2017, having worked on corporate deals for clients ranging from small business startups to large companies, PLCs and private equity investors. In addition to the 35 deals valued at over £500,000, the team also completed a further 41 deals valued at less than £500,000 in the same period. This consistent performance has helped the team achieve a top tier ranking for the North in Legal 500, a leading independent national legal directory. Andrew Davison, head of the corporate team, said: “These Experian results are great news and we are delighted to be named the region’s busiest adviser for the fourth year in a row. Matthew Walsh, associate in the corporate team, who collates and monitors deal activity, said: “It’s fantastic to top the M&A deals league for the North East once again. Our team has an enviable track record in deal making and it’s great to receive independent verification that we are the region’s most active corporate legal dealmaker. “At one point in the summer the team was simultaneously working on several high value deals: Baird Capital’s investment into CAV Ice Protection and CAV Advanced Technologies, LDC’s multi-million pound development capital investment into Patrick Parsons, the £35m sale of O’Brien Waste Recycling Solutions to Biffa plc, Transflex Vehicle Rental’s sale to Equistone backed TOM Vehicle Rental and the takeover of Quantum Pharma Plc by Clinigen Group plc, which valued Quantum Pharma’s share capital at £150m.” he added. To find out how our corporate team can help your business, call Andrew Davison on 0191 211 7950.